Why is the Hungarian government targeting the country's most prominent university? The Central European University in Budapest. Wikimedia. Public domain. 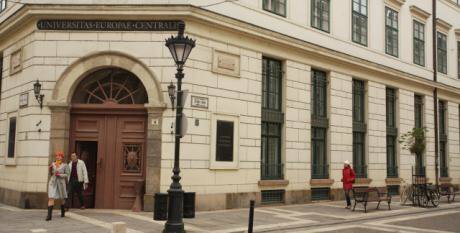 The Central European University - a Hungarian-US accredited private institution based in Budapest and a recognized contributor to Hungarian and international research, has been the target of an increasingly hostile attitude from the Hungarian authorities over the past months. As Prime Minister Viktor Orban tightened his grip on power, acquiring broad control over the media, a concerted, gradual attack on financier turned philanthropist George Soros - CEU’s founder and endowment provider, has been launched, culminating this week with a legislative proposal that would essentially strong-arm the University into leaving Budapest. As a result, support for CEU’s plight soared and continues to come in from CEU’s thousands of alumni, but also current students, faculty, staff and partners. An unofficial online petition to the Hungarian National Assembly collected over 13,000 signatures in little over a day, while the administration encourages supporters to send letters of solidarity to the Hungarian authorities. As the situation is unfolding, with CEU President and Rector Michael Ignatieff hoping to mobilize enough international support to prevent the proposal from becoming law, we should look at how the debate over the matter is framed by the media and commentators, and reveal the case for a stronger stance in favor of academic freedom beyond mere speculation. Naturally, the pro-government Hungarian press - having already been co-opted at various stages of Orban’s 7-years rule to sing its tune - is not only a major perpetrator of defamatory information about CEU, but also a dedicated promoter of Orban’s ‘illiberal democracy’, roughly dividing the world into ‘friends’ (Hungarians, the Hungarian state and its allies) and ‘foes’ (the EU, refugees, the Roma). In this ‘us’ versus ‘them’ rhetoric, CEU and affiliates fit rather neatly into the latter category, both officially - due to accommodating several progressive Hungarian intellectuals among its faculty or opening courses for refugees, for instance - and also unofficially, for example due to the active involvement of the student and alumni body in the myriad of anti-government protests or pride parades over the past years. Hungarian opposition media and Budapest-based English-language commentators (examples, in addition to sources already cited, here, here, here and here) are the main actors seeking to disentangle these reductive, yet extremely powerful binaries (a notable exception here is the opinion piece by a Hungarian conservative, right-wing intellectual, who has publicly taken CEU’s side). While doing an excellent job at revealing the proposed law’s real intentions and providing valuable local context, these accounts place it almost exclusively within the confines of Orban’s ‘war’ with his opposition at home and abroad. At a press conference on Wednesday, it took Rector Michael Ignatieff several instances of restating that CEU is an independent institution, with self-sufficient governing bodies, for the journalists to start thinking that the issue at stake is much broader than the conventional ‘Orban the illiberal’ versus ‘Soros the liberal’. Nonetheless, somebody asked Ignatieff what were the chances of having Soros speak to Trump and ‘put in a word for CEU’. Western media tagged along the same superficial lines, with some accounts not even indicating the university’s actual name in their titles, but rather resorting to variations of ‘Soros-f(o)unded school’ (notable examples here, here, and here). But is this clash really about money, or rather about what it enables? I argue that by focusing more on the link between academic freedom and the culture of dissent - both the real threats to Orban’s rule and the implicit objects of this legislative proposal, we can contextualize this attack and construe of its implications more thoroughly. First off, a point of clarification: surely CEU has benefitted from Soros funding and still does. It must be added here that CEU also channels significant EU research funding, as well as increasing voluntary contributions from its alumni - around 25 students receive alumni-funded stipends every year. Therefore, it is true that CEU embodies ‘foreign money with an agenda’, but so does Hungary as a state by means of its own exemplary capacity to attract EU funding. Perceiving CEU exclusively as somebody’s personal ‘investment portfolio’ and the amazing things one can do with money - rank in top 50 universities worldwide for some programs, offer millions in stipends for prohibitively expensive degrees, pay millions in taxes and social contributions - renders a kind of mercantilist picture of the University that strips it completely of its values and the experiences of its students. I therefore claim that CEU embodies a deep commitment to academic freedom, and that, for all its faults, it is pretty good at implementing it. This is what must truly agitate the Hungarian government: beyond the fear of ‘foreign money’, and with that, of rival foreign influence, it is the fear of freedom that is so deeply unnerving. As Ignatieff himself put it at the aforementioned press conference, it is the freedom to teach, recruit, hire, fund, research, and publish that really comes under attack with this legislative proposal. While almost always implied, this side of the argument often remains underexplored, and it appears necessary to remind the public that the fundamental tenets of academic freedom provide us with the best capacity to truly grasp the severity of this situation. But CEU does not operate in a political void, and despite having managed to stay afloat throughout a period of intense change in Hungary, while offering itself as a safe environment for debate, CEU has found it increasingly difficult to play the role of the ‘neutral educator’. Even if the voices of dissent inside CEU have always been free: free to speak up, organize, mobilize, protest, put out posters, spread messages, call for change, hold public events, and so on, make no mistake: CEU is not a paradise of liberalism, socialism, anarcho-feminism, or any other ideal worshiped by students or inflicted upon it externally. Academic freedom does not automatically lead to a sound culture of dissent within the CEU community, and much less so between CEU and relevant external actors. Speaking truth to power, as goes the slogan of CEU’s School of Public Policy, takes a stronger rooting in the surrounding reality and a much more politically aware practice of academic freedom. It is in this context that a solution must be devised. Whatever the remedy, whether it remains in Budapest or not, CEU will have to revive its political engagement within the society hosting it and reconfigure its role as a defender of open society. ‘Academic freedom is not some abstraction’, declared Ignatieff at a community forum with students, staff and faculty this week, but neither is it devoid of political meaning, as he seemed to suggest. To cultivate freethinking and dissent, academic freedom must be understood as a fundamentally political concept, requiring constant reinforcement and protection from its staunch opponents, of which the Hungarian government is just one of the many. Perhaps the Rector saw this coming: soon after starting in his role, Ignatieff launched an initiative to ‘rethink open society’ and CEU’s commitment to defending it. Perhaps #IstandwithCEU must become part of this plan, maybe even the very core of it, so as to prevent us, CEU alumni, students, faculty and staff alike, from getting a little too comfortable and self-gratifying about the values we claim to uphold.